Here's one I've been meaning to feature from the very beginning of the Weekly Penguin feature, but haven't been able to. 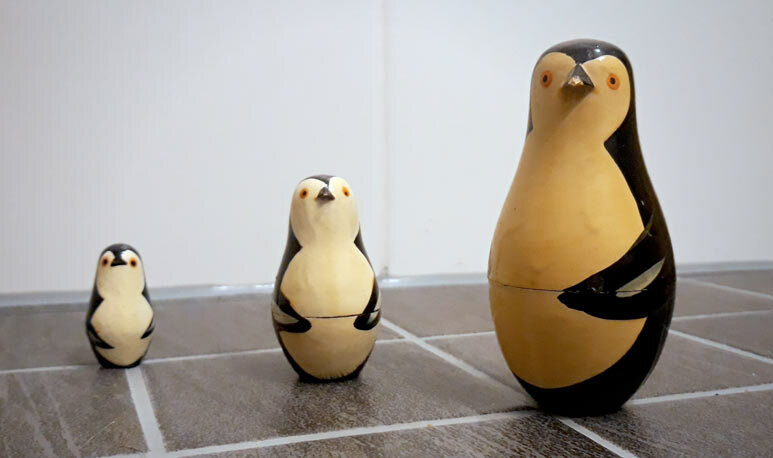 This is a penguin matryoshka doll, going two layers deep. You may know matryoshka dolls by their other name, the Russian doll; all the figures fit together inside each other. I got this from the now-defunct chain of trinket shops called Tiimari in the mid 90s. The reason I haven't featured these until now is simple; in some house cleaning or the other, the dolls got separated. The outer shell was on display with my other Tiimari-purchased penguins, whilst the inner ones went missing. However, in the recent cleaning I re-discovered them and the doll is complete once more!